Rustic and warm, the Ruff Sawn Morris Dining Chair features a long and lean ladderback to rest against. 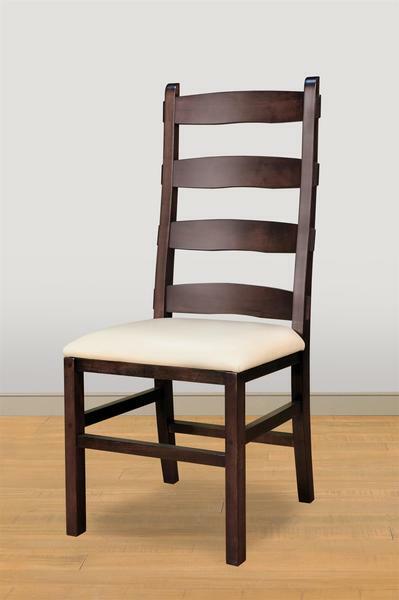 The horizontal rungs are wide and inviting, while the chair seat is available in your choice of wood or leather. The wood used is rough sawn wormy maple wood that showcases your choice of finish. Wood that is rough sawn is a rough cut with man made markings that include saw marks and pin holes that add a rustic texture to the wood. This option mimics reclaimed wood, with more control over the finished product. Furniture featuring rough sawn wood blends beautifully with country, rustic, industrial and modern decor. From the Ruff Sawn Furniture Collection, the Ruff Sawn Morris Dining Chair features a seat depth of 22" and a seat width of 19". This wood dining chair is a lovely match for the Ruff Sawn Rustic Carlisle Dining Table. When you love everything about wood that looks a bit worn and loved, Ruff Sawn Furniture is a solid wood furniture collection to explore. Step over to our popular blog post, Reclaimed vs. Rough Sawn to learn more. We are happy to answer any questions about our dining room sets. Please email or call us on our toll-free line, 866-272-6773. Thank you for shopping with DutchCrafters.